Again, I don't have the greatest pictures from Belize because our hands were full. But it was a beautiful port full of interesting plants and animals that I would've liked to have photographed if I'd had the chance. We went to a nature park 45 minutes from the port called Bacab Eco. It's a nice place with an emphasis on experiencing Belizan nature. 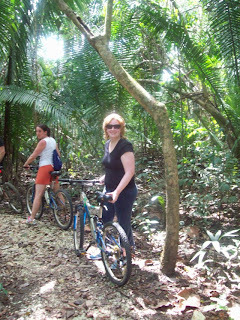 Here you can visit the butterfly house, go horseback riding, kayaking, or jungle biking. Tom and I wanted to try jungle biking, so my mom and step-dad booked the butterfly excursion and took the boys on that while we spent an hour cycling. The butterfly excursion was long and out in the open, so it wasn't the best choice for the boys. They left the tour early, but this was fine because Bacab Eco provided a nice complimentary lunch (grilled chicken, rice and beans cooked in coconut milk, plantains, and fresh fruit) and had a beautiful shallow swimming pool to play in. Tom and I had a great time jungle biking. Neither one of us had been on a bike in over a decade, so it was a bit challenging at first getting used to riding on twisty jungle paths. Luckily it was flat, and we stopped often while our guides pointed out interesting flora and fauna. 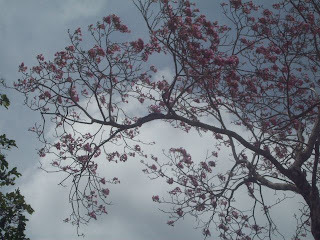 For example, we were shown a tree that is 100 times more poisonous than poison ivy. You tell tell what it is by the leaves that look like they are covered in cigarette burns. This is where the sap has dripped on the leaves and burned holes in them. If the sap gets on your skin, it can cause first degree burns. Luckily, there is a plant that acts as its antidote and it grows nearby. This tree is a Mayflower and they were everywhere. If you look towards the far left of the branches (and squint really hard) you will see the large black iguana sitting on a branch. These iguanas were everywhere... in the trees, sitting on fences, in people's yards. They were about as common as our squirrels. After our tour ended, we joine up with Mom, big Sam, and the boys for lunch and some swimming. John, who hates baths, decided he loved the shallow pool and crawled happily through the water like a little tugboat. It was a great end to the day. It sounds like a great trip! I love the monkey pics- you are braver than me to try it w/ 2 little ones. Oddly enough, that's what we kept hearing from them! "It's wonderful that you're giving your kids these memories--you're so brave!!!" And I think to myself "Seriously? You consider this brave? I was up for a whole lot more..."
If it meant getting of the cruise ship and onto wide open ply-able spaces with the boys, I would have repelled off the cruise ship,swam to port, and then bushwhacked through the jungle to reach civilization--it was that bad! i have an unrequited love affair with belize! you are so lucky! i have always wanted to go and help categorize medicinal plants that the old 'witchdoctors' who are dying out know about, but not the rest of the world. there's an intersting herbalist/spiritual book, shoot on a different bookshlef upstairs, called 'sastun' i believe, that really made me want to do so even more.